In honor of Elizabeth Chadwick's release day today I wanted to present this article written by Elizabeth Chadwick which was previously posted in June. Lady of the English paperback has been released by Sourcebooks and you can also look for the beautiful hardcover from the June UK release by Sphere at the BookDepository or Amazon.uk. 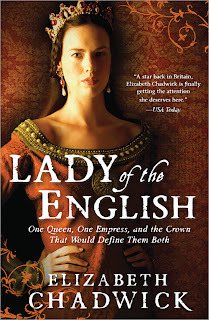 I really enjoyed this newest medieval novel from Elizabeth Chadwick (my review can be found here). 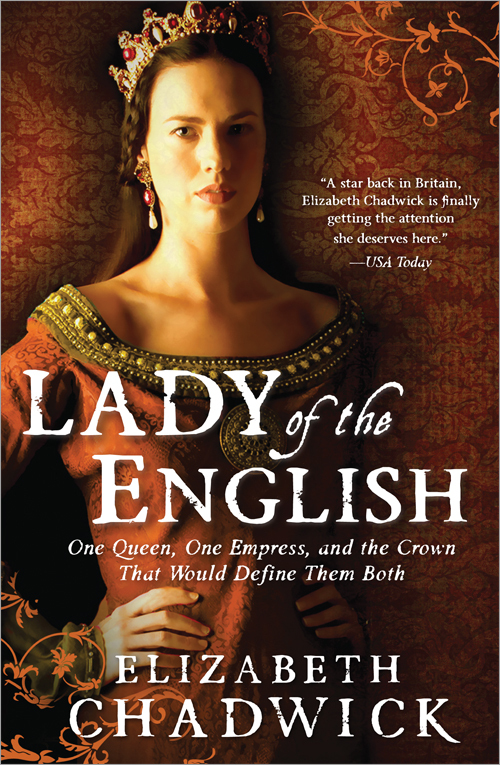 One of the most favored historical fiction authors of our day, here is Elizabeth Chadwick, as I asked her to set the scene of her new novel for those who might not be familiar with The White Ship disaster and the ensuing struggle between Empress Matilda and King Stephen. I myself had read When Christ and His Saints Slept by Sharon Kay Penman which begins with the White Ship Disaster. That book got me started on this fabulous journey of the medieval era, and it is with eager anticipation that I get my reading pleasure back to that historic time period. On November 25th 1120, King Henry I of England was at Barfleur in Normandy preparing to return to England. He was in settled middle age, but still looking to the future. His eldest son William was in his late teens and being groomed to eventually succeed his father as Duke of Normandy and King of England. Henry's daughter Matilda, also in her late teens was Empress of Germany. Henry's wife, Matilda, had died two years ago, but Henry was now looking to remarry and had already set matters in motion and was contracting to wed Adeliza of Louvain, a young woman of similar age to his daughter. Adeliza was accounted beautiful and pious, and Henry was keen to marry, and hopefully beget more legitimate heirs beyond the two born of his first wife. Henry had something of a reputation for liking the ladies and fathered at least a score of bastards on various women. But that cold winter's night in Normandy, everything was to change. Henry set sail first in daylight with a lot of older, sober court members, but left the youngsters including his son and several of his illegitimate offspring, to their carousing and pleasure. It was the last Henry ever saw of them. The White Ship foundered when it hit a rock in Barfleur harbour, and sank without survivors save one - a butcher who clung to a spar and was washed ashore. Henry's whole game plan had to change because now the only legitimate heir to the throne was his daughter Matilda in Germany. He went ahead with his marriage plans, but it became obvious that no child was going to be forthcoming from Adeliza. Young and beautiful though she was, she did not quicken. Henry began to cast around for a successor and his gaze fixed upon his nephew Stephen, son of his sister Adela. Stephen had an older brother Theobald, who would become count of Blois, and a younger brother Henry who was destined for the priesthood. Stephen in the middle seems to have attracted King Henry's interest and approval. He had grown up at the court with tragic young Prince, and had only been saved from drowning himself because he was suffering from a stomach upset and preferred not to embark on the fated White Ship. Henry married Stephen to Matilda of Boulogne, who was kin on her mother's side to the old Royal Saxon house of England, thus giving Stephen a firm claim to the Crown. There was another claimant to the throne too, a young man called William le Clito. He too was Henry's nephew, but an enemy because he was the son of Henry's older brother, Robert. Henry had defeated Robert in battle way back in 1106, and had had him cast into prison ever since - where he was subsequently to die. When le Clito was old enough, he took up his father's gauntlet and laid claim to England and Normandy. However Henry's grip was strong and sure, and although le Clito fought hard, he was hampered by a lack of resources and his threat to Henry was to end in 1128 when he died from a poisoned battle wound. And that is exactly how I believe Henry felt. He could play one off against the other. If one displeased him or if policy changed that he could turn to the other. I also think that he was hoping to live forever, or at least until his grandson's were grown up. Externally he might have prepared to meet his own mortality, but internally he had no intention of giving up his fistfuls of power. When he did eventually die – (did he jump or was he pushed?) The Blois faction were well placed to seize the Crown, and I think their swift action was premeditated. Stephen was at Wissant which was a short sea journey from England, and his brother Henry was at Winchester and in control of the Royal Treasury. You tell me whether there was a conspiracy or not! Matilda on the other hand was in Anjou with her husband and sons, and newly pregnant again. No one came galloping to offer her the crown. Instead it was all stitched up by the Blois faction and the reluctance of barons to accept a woman on the throne, when they could have a man. Nevertheless, they had sworn their allegiance to Matilda, and Matilda had not only her own right to fight for, but that of her small son, Henry - and fight she did, to the great cost of the lands involved, the people, and herself. Adeliza helped her in that fight. Indeed Adeliza was immensely important to Matilda. After Henry died she married William D’Albini, a young baron who was a staunch supporter of Stephen. But despite her loyalty to her husband, Adeliza was determined to do what she felt was right by old obligations and ties. When Matilda came to England to fight her corner, it was Adeliza who gave her a safe landfall. 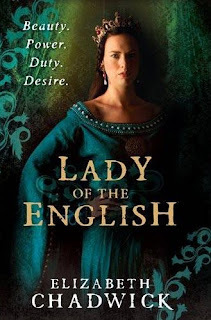 LADY OF THE ENGLISH begins the story in 1125 when Matilda is setting out from Germany to return home, and Adeliza is despairing that she will never bear Henry an heir. Both women were titled ‘Lady of the English’ in their lives, and and that's why I chose it for the novel. It was always given to the Queen of England in that period, and although Matilda never gained the Crown, she was acknowledged with that tribute. THANKS SO MUCH TO MS. CHADWICK!! Also, please visit some of my other Elizabeth Chadwick posts, which includes reviews of previous titles. Additionally, you may visit with Elizabeth Chadwick on her blog and website. Also, very helpfully Elizabeth Chadwick has kindly supplied us with a Suggested Reading Order for her novels which can be found here.